“You know that place between sleep and awake; that place where you can still remember dreaming? That’s where I will always love you. That’s where I will be waiting”- Peter Pan. 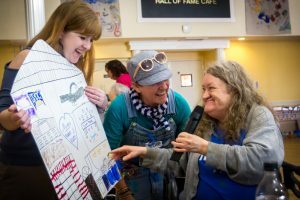 As the artist team ended the second day of residency at Morgantown Care and Rehabilitation, I felt as if I was in that place where it could be a dream or it could be reality. You know the place. The feeling you get when you feel as if you are soaring, the natural high that comes from being part of something that is so meaningful it shakes your very core. As soon as the team entered Morgantown Care and Rehab, we knew we were in for a very special day. There were already close to 50 people gathered to meet the artists to participate in the morning’s workshop before we ever arrived. The theme of the day was thoughts of home. What were some things that remind you of home? If you could build a dream house, what would be included? What are your favorite memories from childhood? What words would you use to describe childhood? The answers were beautiful. Images such as tree swings, reading, skates, horses, apples, and farms all started to arise from the Elders in the room. They shouted out words while Anne quickly captured their thoughts for the afternoon workshop. You could almost see the excitement building in the room as everyone remembered exactly what home means to them. 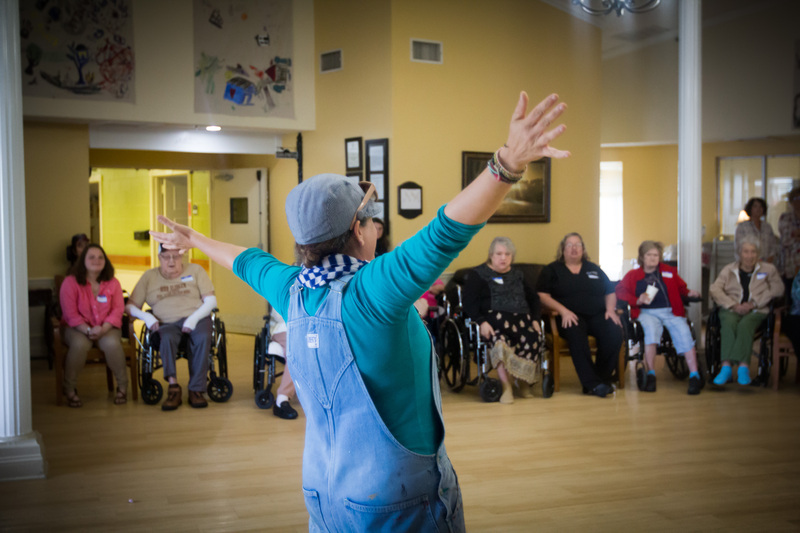 Stakeholders, Volunteers and Elders alike joined in a song led by Liz Jarboe, a new volunteer to the project. The magic continued as Iega warmed up the room for flying. He prepared them mentally by bringing such a calming spirit. 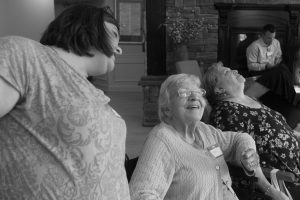 Everyone enjoyed creating their own movements for their favorite childhood memories such as apple picking, swimming the backstroke and the doggie paddle and reading a book in a tree. One lady cried tears of joy as she joined the movement to turn the pages to her own book, letting us know that her favorite thing to do was swing a leg from a tree while reading a book! The afternoon was a deeper dive into childhood memories. 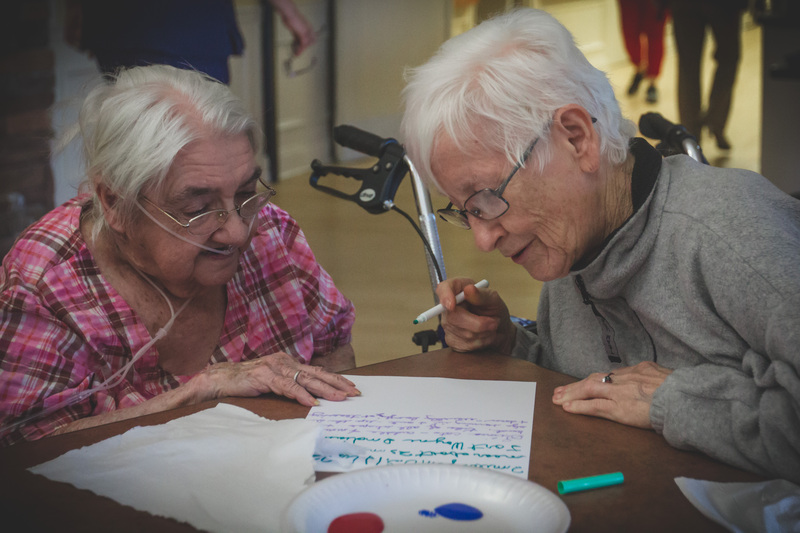 The group worked in small groups to collectively create images of home. This session focused on building out the memories from earlier and expanding the idea of those memories into visual art making. 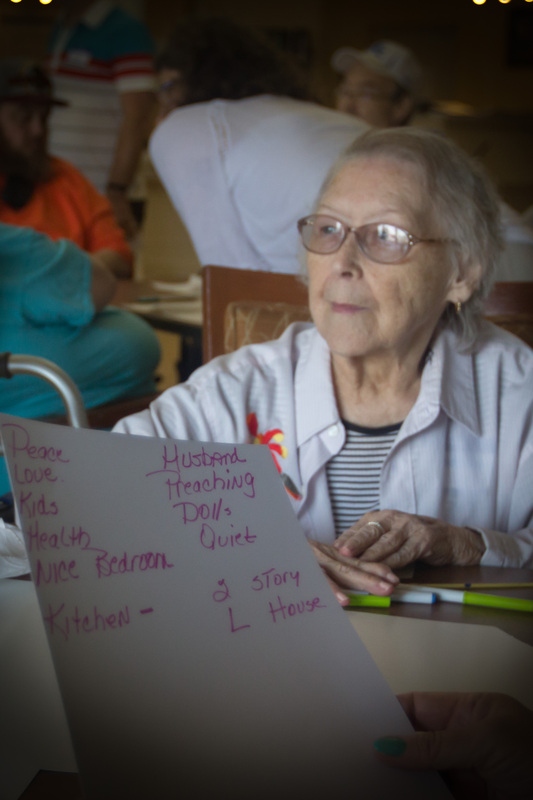 Elders, Stakeholders and families worked side by side to envision what home was like to them. Laughter and joy erupted in the room as people played with paints and markers. There were visions of staircases with children running up and down them, trees with tire swings, a fishing pond that later looked like a bicycle and field to play super hero in. The activity itself was a beautiful thing. It was more than an activity. 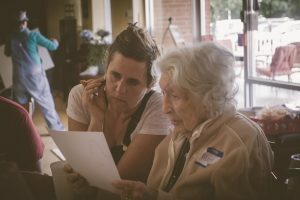 There was a level of communication and engagement from every individual in the room that allowed for the space to build community. In fact, it was the joy of sharing space together. 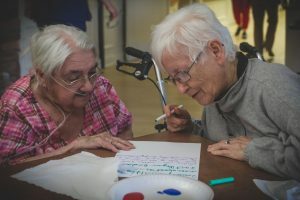 The beauty of allowing time to slow down for a day, to forget about the “tasks” that haunt most skilled nursing facilities and the excitement of transforming into something beautiful. As the day came to a close, it became apparent to me that this project was more than magical. Neverland really isn’t a place after all, it’s a feeling and I am already beginning to sense its presence everywhere I turn! Stay tuned as we travel to Brodhead, Kentucky next! This project was funded by a Civil Money Penalty (CMP) Grant through the Kentucky Office of Inspector General and the Centers for Medicaid and Medicare Services (CMS).